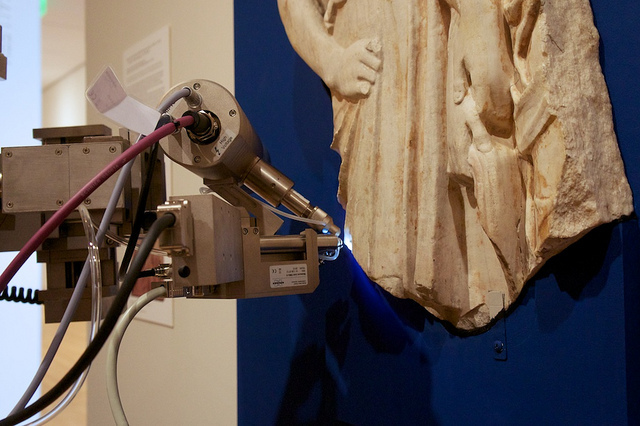 An ARTAX Micro X-ray fluorescence spectrometer (abbreviated micro-XRF) was recently used to examine painted and unpainted areas on the Orpheus Relief. 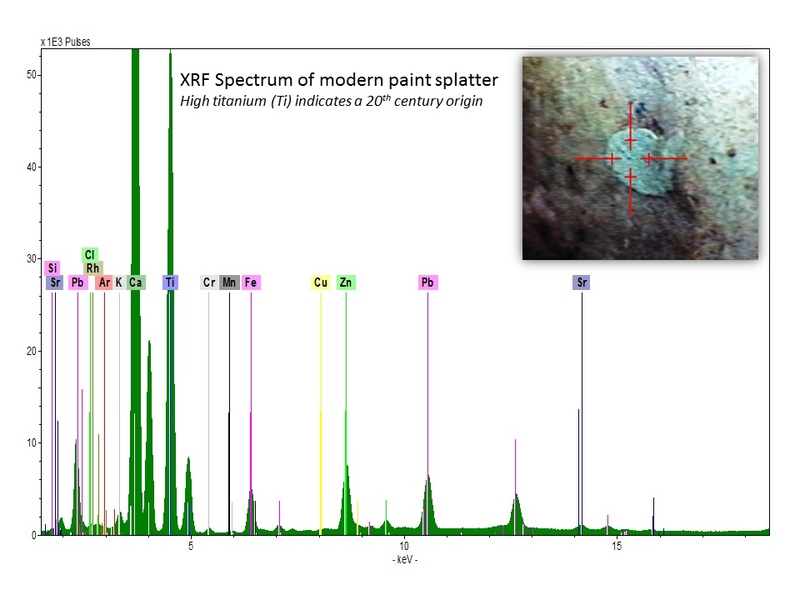 The ARTAX is a semi‐portable open beam XRF machine used for non‐destructive elemental analysis of surfaces. The instrument has a built in camera that allows the analyst to view and capture an image of the area that is being analyzed. 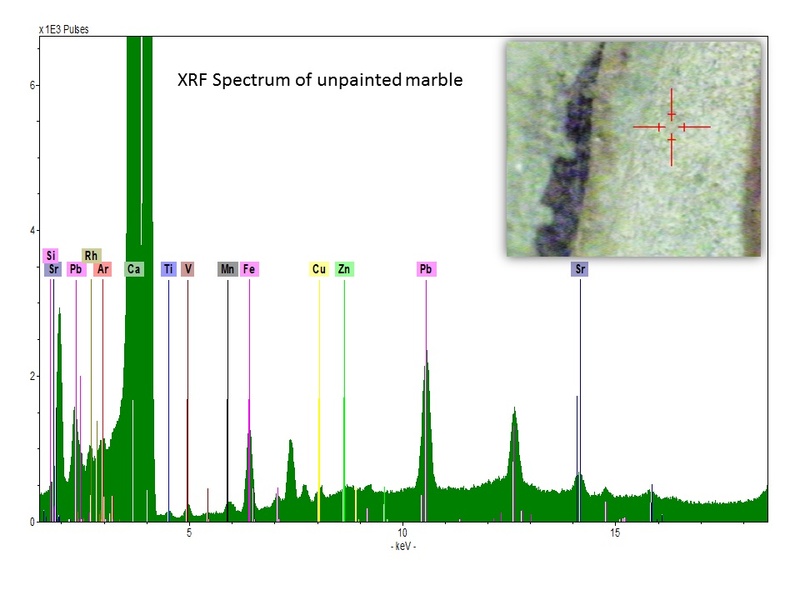 By understanding what elements are present in a given area, it is possible to identify some types of paints that would have used to decorate the relief. For example, modern white house paints typically contain large amounts of the elements titanium and/or zinc to produce the white color. Black paints can be made from minerals containing iron, manganese, or chromium; or from carbon based materials (“lamp black”); or even charred bone (“bone black”). Finally, red and orange paints can contain iron-oxide pigments, lead oxides, cadmium, or even the mineral cinnabar (mercury and sulfur)—just to name a few examples. Every element has a characteristic electron structure. When inner shell electrons are ejected from an atom, electrons from shells with less binding energy fill the holes and may release X-ray radiation equivalent to the difference in energy between the level the electrons came from to that which they went. The X-ray radiation released during these transitions is characteristic to the element and has a specific energy depending on the transition made within the atom. By exposing a sample to localized radiation that exceeds the binding energy of the electrons in the atoms of which the material is composed of and detecting the energy and number of resultant characteristic X-rays emitted from each element, it is possible to determine the composition and proportional concentrations of those elements. 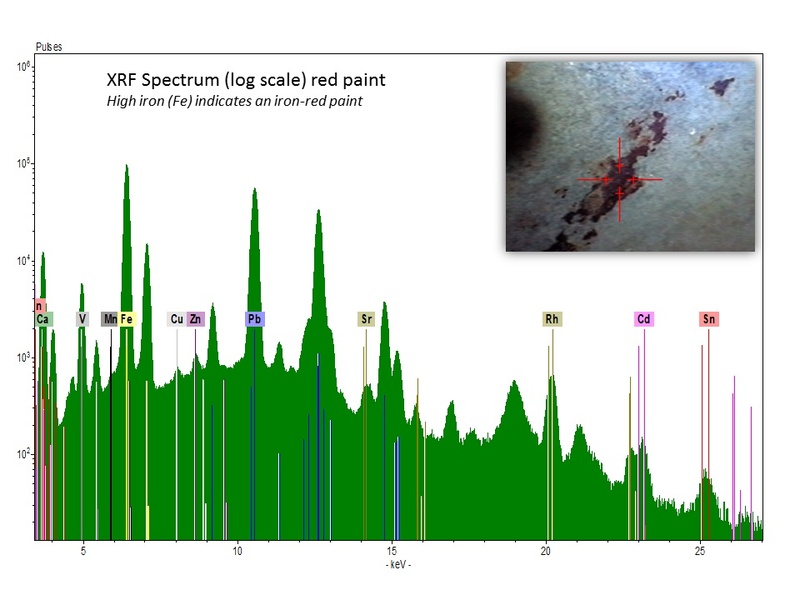 The results of an XRF analysis comprise what we refer to as a spectrum–the graphical representation of the elements present in the analyzed area. 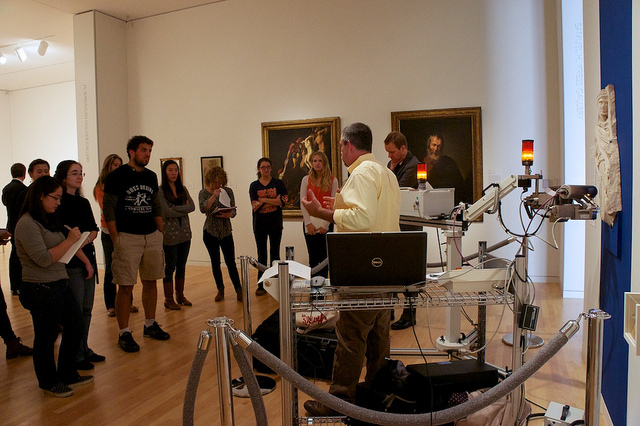 Below are several such examples including (1) the analysis of an unpainted area on the Orpheus (marble is primarily made of calcium); (2) a modern paint that dripped onto the sculpture probably when an exhibit gallery wall was being repainted sometime during in the 20th century (the high titanium); and (3) an iron red paint that was used to decorate the Orpheus after it was carved. Over the next few months, we will examine the data generated from these analyses. 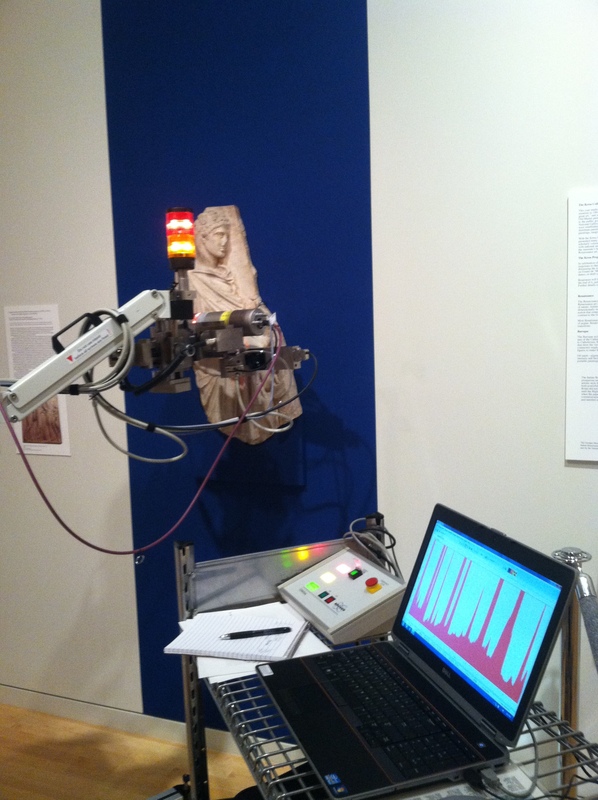 In conjunction with other analyses we hope to develop a better understanding of how this sculpture was painted. This entry was posted in Project Updates on December 7, 2012 by Laura. Detailed examination of the Orpheus Relief began last week with an innovative application of hyperspectral imaging to elucidate the painting and other surface phenomena on the artwork’s sculpted surfaces. Preliminary results will be presented shortly on this blog. This study was featured in an article in the local newspaper, the Athens Banner-Herald. This entry was posted in Media Coverage, Project Updates on October 22, 2012 by Laura.